6503 Collonade Court, Whitsett, NC 27377 | Under Contract In Less Than 3 Months! That's over $28,000 under Tax Value! Dues are $38.50/Mo. with swimming, tennis & gym! This home was purchased for $226,000.00. Due to the downturn in the real estate market, now you can buy it for a fraction of the cost at $186,000.00. Don't miss this opportunity to buy at a bank-owned price without the hassle of dealing with the bank! 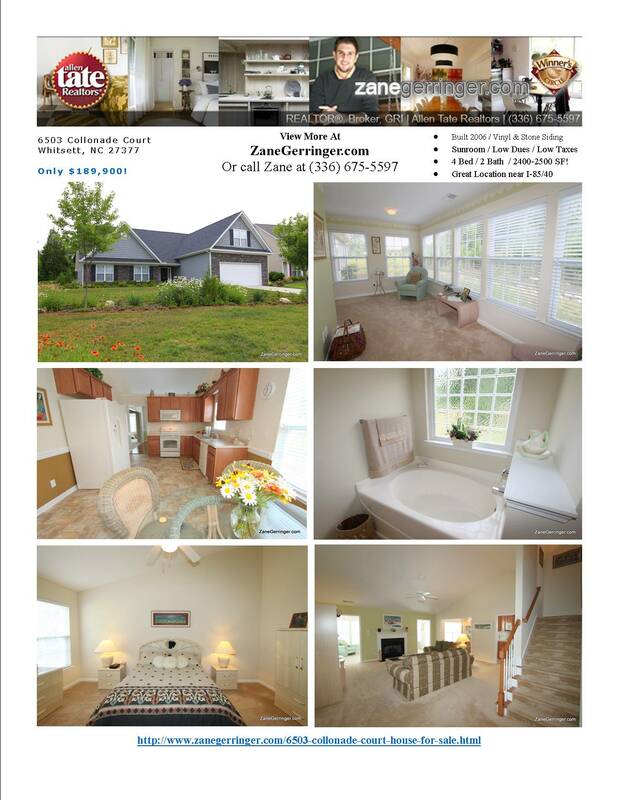 ~Not to mention that this home is immaculate and move in ready! This spacious home in The Reserve at Rock Creek boasts over 2,400 square feet with 4 bedrooms, 2 full baths, a 2-car garage, sunroom, vaulted ceilings, low dues (that include swimming & tennis) and more - all for less than $80 bucks a square foot! Want More Info On 6503 Collonade Court?